In the ocean, CO2 reacts with water and carbonate ions to create carbonic acid. Elevated CO2 levels reduce the concentration of carbonate ions. Shells of many marine organisms are made of calcium carbonate, which has two main forms: calcite and aragonite. Both minerals dissolve at low carbonate ion concentrations – known as “undersaturated conditions” – unless the calcifying organisms have evolved mechanisms to prevent dissolution, such as protective layers or other means to isolate their carbonate structures from exposure to corrosive water43. Aragonite, which is formed by corals, by the first larval stages of many molluscs, and by some adult molluscs (including pteropods), is more soluble than calcite, which is produced by coccolithophores, foraminifera, echinoderms and crustaceans. The scale for describing the level of saturation of calcium carbonate in seawater is the “saturation state”, Omega (Ω), where Ω < 1 indicates undersaturated (corrosive) and Ω > 1, supersaturated waters. 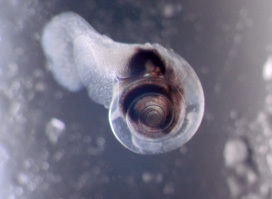 In an acidifying ocean, skeletal and shell growth generally slows down significantly as the saturation state decreases. For example, coral growth benefits from high aragonite saturation states, larger than 3 (Ω ≥ 3)44. Deep waters naturally contain more CO2 and have a lower pH compared with the surface ocean. Furthermore, calcite and aragonite saturation decreases with increasing pressure. The boundary between these deeper undersaturated waters and the shallower saturated waters is known as the “saturation horizon”. This process is well understood and well documented at a global scale. The saturation horizon will reach the ocean surface by the end of this century in the North Pacific, the Arctic seas and Southern Ocean, under RCP 8.5 (see Future CO2 Emissions). In upwelling areas such as in the northeast Pacific Ocean and along the western coasts of South America and Africa, naturally more acidic deep waters upwell onto continental shelves. The ocean uptake of anthropogenic CO2 has increased the extent of the areas affected by more acidic waters45, which include important fisheries grounds. This entry was posted in For Policymakers. Bookmark the permalink.